Fight on you Orange and Green: In 1939, Auburn’s varsity eleven played some of its games in orange jerseys (light jerseys). Most of them were played in green (dark jerseys). You know, like Notre Dame. Photo: AU Plainsman. The Auburn Tigers wore orange jerseys in five games in 1938. They lost four of those games. 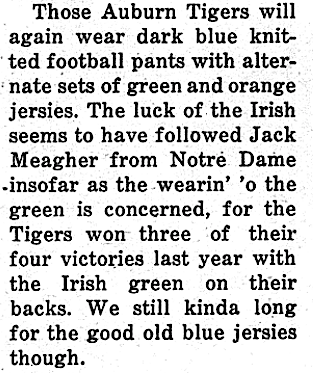 So in 1939 they went back to what worked, what they wore in the games they did win in 1938: Green jerseys. 2007. David Housel’s wonderful “Auburn Football Vault” is published. I buy my copy at a Lee County Auburn Club meeting. I think Al Borges is speaking. Housel signs it. I read it. “… who has brought the orange and blue of Auburn into the spotlight of national recognition.” And baptized them in the green of Notre Dame. Wait—what? Green jerseys? What? Green? What? It’s not a misprint. But how can it be true? And which entire season exactly? Even in a college football era with an Irish fetish, it just seems weird. How have we never heard about this? I mean, this isn’t a going from blue to orange situation. This isn’t just switching one team color for the other team color. This is switching one team’s color for another team’s color… for “the glory and honor” of that team. It’s borderline blasphemous. No, it is blasphemous. And a dark mystery. I put it away in the vault. Try to forget about it. Keep it quiet. January 2013. Bama is playing Notre Dame for the national championship. TWER looks to give moral support to the Irish (kiss me I’m Auburn). Perfect—here’s an Auburn fan at the 1976 Notre Dame-Bama game. Is there anything else we can use… wait–the vault! At least for a day or so, I think I might not mind so much. Maybe. But I have to make sure it’s true, or rather, I have to figure out what we’re actually dealing with. I haven’t seen any other reference to green jerseys since 2007. I need primary sources. When it came to Auburn tradition, Jack Meagher was a little green. I call Chappy’s Deli, ask for Housel. He gives me the spiel from the book. I press on. But what worked its way through? And how? And why? My theory: Maybe there had been talk of it. Maybe one was even made, a mockup (and maybe ended up at Auburn’s athletic museum). Maybe Meagher really wanted them, but the idea was shot down. This was my theory. I’m a genius. Possibly psychic. There were green jerseys once upon a crime— and since Babe did most of his gridding in 1939, we probably have the year—but they “didn’t last long” (and surely not “an entire season”) because the players didn’t like them, “the team objected”… you know, because they were green. Maybe they didn’t even make it out of the locker room. May 2012. I go on the radio. I tell it on the airwaves. Over the hills and everywhere. Identity crisis averted, Auburn fans. Thanks to Babe McGehee. Now for the Internet. June 2012. Let me just check the Glom’s write-up on the 1939 season to maybe flesh out the post. So many thoughts… so many thoughts run through my head: What, Mr. Glomerata? When the average fan sees a blue breeked and green jerseyed Auburn varsity eleven trot onto the field, he should freak out. Because they’re green jerseyed. Wait, Babe—“didn’t last long?” Were you speaking relative to, like, the 1939 season, or the entire history of Auburn football? Because it was apparently long enough to make the words “green jerseyed” show up in the very first sentence of the yearbook’s football section. Two days ago. We finally have a year, a green year—1939. The search for the truth in the Plainsman has been narrowed. I grab my Diet Coke and settle in. September 1939. Auburn junior Boots Stratford is killing it with his Tiger Tales column for the Plainsman. The Orange and Blue are a week away from their season opener against Birmingham-Southern. Time for a preview. Deep breaths. At least it’s alternating, I guess. But… again? October 1938. Auburn sophomore Boots Stratford is killing it with his Sports Chatter column for the Plainsman. The Orange and Blue—he says “the Orange and Blue” more than anything, the irony never registering, at least in print—are two games into the new season. But something’s different about them. Why? Me, too, Boots. Me, too. And Lord, there was no announcement! Poor Boots just had to wait another year and deduce the whole “must be the luck of the Irish” thing when he saw it happening again. October 1939. The color orange is cursed. When The Orange and Blue wear orange jerseys, the Orange and Blue lose. Boots Stratford officially declares the orange jerseys a jinx. 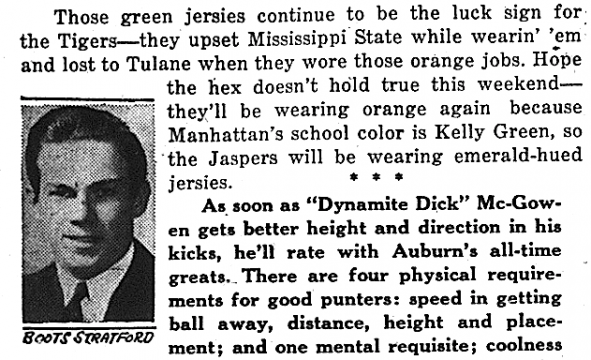 And do you know why they wore them against Manhattan and Tulane? Well, because we couldn’t have two green teams on the field now could we? 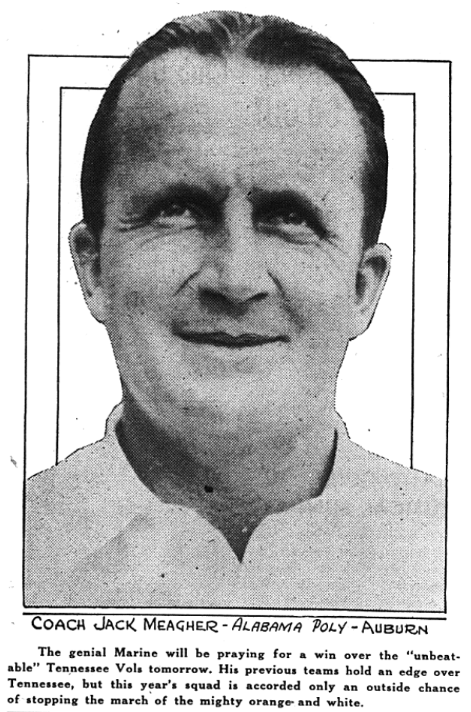 November 1939. Boots Stratford declares the orange jersey curse broken. Thanks, Villanova. November 30, 1939. It’s the first game in Jordan-Hare Stadium (then Auburn Stadium), homecoming vs. Florida. 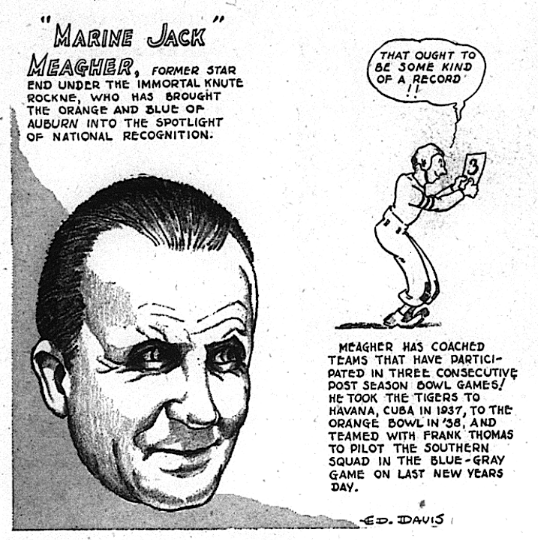 The first touchdown scored in Auburn Stadium is scored by Babe McGehee–of course. Does he object to the color jersey he’s wearing? Today. Looks like it was an orange jersey. Green jerseys. Green jerseys. Green jerseys. Auburn wore green jerseys. Related: “Dear Babe…”: Letter congratulating first Auburn player to score touchdown in Jordan-Hare; came against Florida in 1939. This is the type of article that brings me to TWER. Good job and I was chuckling the entire time. I say let them wear green again. Not for the Irish but for the Oaks. Auburn Oaks Green. I’d be ok with that. I recall reading Bear Bryant’s autobiography. In it he states and I’m paraphrasing, that he would accept a national championship if it came from a local icehouse. Sorry I can’t give the exact quote. I loaned the book to a preacher and he never returned it. Come to think of it, I believe the 1941 Alabama Team with 3 loses and not winning the SEC claimed a national championship. What was the name of that icehouse? Great writing. Really funny. . I vaguely remember Auburn wearing orange jerseys once in the early 80s and getting beat bad. I’m not sure if it really happened though I’m pitiful. Thanks, really appreciate it! And you remember correctly.